We've got something a little different for you today. As alluded to in the post below, Carrie Patel, author of The Buried Life, is going to talk to us a little about herself, about her new novel, Cities and Thrones, and about life, the universe, and everything.Thanks awfully, Carrie - the below was a lot of fun, and gives a lot of great insight. Perhaps the first thing I should do is start with an introduction – so, who is Carrie Patel? I’m a writer and narrative designer. I work at Obsidian Entertainment, a game development studio, by day and write novels and short stories the rest of the time. I have a particular love for fantasy and science fiction, but my genre tastes are fairly broad. 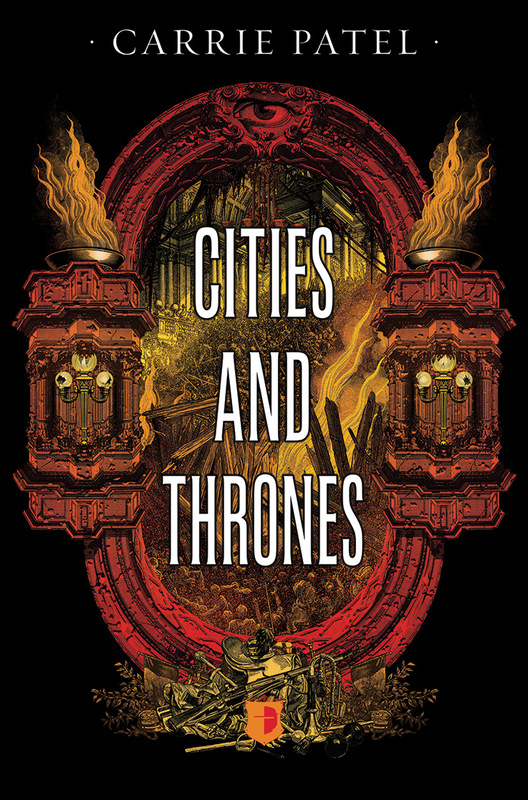 The second book in your Recoletta series, Cities and Thrones, is out on the 2nd of July. What can fans expect from this latest volume? Big changes! If you read The Buried Life, you know it ends with a pretty significant development for the city of Recoletta. Cities and Thrones picks up immediately afterwards and follows the maneuverings of Recoletta’s neighbours. It also follows the original characters as they cope with the political machines at work around them. Can you talk a little about what inspired you to write Cities and Thrones, and the wider Recoletta series? In writing Cities and Thrones, I wanted to tell the story of the consequences and complications of the seemingly triumphant changes that occur at the end of The Buried Life. I was inspired by all of the fascinating (and often heartbreaking) stories of idealists and reformers who take over only to end up creating more problems than they solve. With regards to the series as a whole, I’m not a die-hard mystery reader, but I love the mysteries that often end up in a lot of my favourite science fiction and fantasy. And to me, telling a story about an underground civilization built on secrets and ruled by a corrupt group of elites seemed like the perfect setup for plenty of turns and intrigue. As a follow up: History, and the fear of the past, is a key theme throughout both The Buried Life and Cities and Thrones. What made you approach this topic in particular? Once I put the setting together, a dark history seemed to emerge as a necessary part of the story. After all, if Recoletta and the other cities had been founded to protect people from a disaster that no one was talking about, it seemed important to build that history—and people’s fear of it—into the story. It seemed like Chekhov’s gun—once the idea was there, I couldn’t leave it untouched. Liesl Malone is a unique and intriguing character – what were your inspirations in creating her? Detective stories are filled with brilliant oddballs, many of whom are great with facts and terrible with people. I wanted to take a character like that and dig at her manias and vulnerabilities a bit. I wanted to find the situations and personalities that might crack through her exterior so we could see what she’s made of. Readers will always have their favourite characters in any book – which of yours is your favourite to write about? Definitely Roman Arnault. He’s a pretty colourful character—by turns he’s crafty, mulish, and suave—but he’s pretty much always up to something. Writing him through the eyes of the perspective characters observing him is always pretty entertaining. Again as a follow up: Are any of your characters particularly difficult to write? Malone is probably the most difficult. She plays her cards close to her chest, but she’s definitely affected by events around her, especially in Cities and Thrones. Communicating her reactions and her metamorphosis is one of the more difficult bits of the novel. Cities and Thrones takes your characters out of their comfort zones a little bit, and gives us a broader perspective on their world – what sort of research was required for Cities and Thrones, compared to The Buried Life? I spent some time looking at actual revolutions and their outcomes—when they fail, how they fail, and the nature of the narratives that grow around them. The events of Cities and Thrones obviously aren’t based in history, but I wanted them to feel robust and true to life. The nice thing there was that it was fairly easy to build stories for the characters around that—there was plenty of action and complexity for them to confront new challenges and find their own niches. Did you find writing Cities and Thrones, a sequel, harder or easier than completing your debut, The Buried Life? And in what ways? The two processes were very different. I wrote the first draft of The Buried Life in a year and then spent years revising it on and off. In that time, I developed the skills I needed to write (and revise) a publishable book. I wrote Cities and Thrones much faster—the process of writing, revising, and plot-tinkering took about a year, and it was much less “linear” than the process for The Buried Life, where I made iterative processes at essentially the same manuscript. Both processes felt difficult when I was in the middle of them, but I’d say the process for Cities and Thrones was more challenging overall. You’re also a narrative designer for Obsidian; were you able to draw on your experiences there whilst writing the Recoletta sequence? I actually started working at Obsidian at almost the same time I sold The Buried Life. In terms of subject matter, the Recoletta series is very different from Pillars of Eternity, which I’ve written for at Obsidian. However, writing for computer games is a wonderful exercise in structure, and that’s something I’ve tried to apply to all of my writing. I like a range of genres, from science fiction and fantasy to literary fiction, thrillers, and mysteries. I just finished Walter Mosley’s Devil in a Blue Dress and am also near the end of Neal Stephenson’s Seveneves. I usually get up early during the week—often around 5:00 or 5:30 in the morning—so that I can get ready, have breakfast, and spend a couple hours writing (or taking care of writing business) before work. Many days I take my writing laptop with me to the office so that I can find a place to sit down and write some more after work. I’ve found I’m often most productive if I do my evening writing away from home. Weekends are a bit more variable, but I try to carve out a little writing time during the morning or early afternoon on Saturday. Another follow up; some authors plan their novels in great detail before setting pen to paper; others seem to take a more seat-of-the pants approach. How would you describe yourself on that continuum? I’m a hybrid, but I’m definitely closer to the planning end of the spectrum. I tend to outline and take a lot of notes because I need some sense of direction before I start writing. But I often find that many of the “aha” moments occur while I’m writing, so my plans and outlines tend to evolve as I go. What made you first want to become a writer? Is it something you’ve always wanted to do, or has it come upon you more gradually? I’ve always loved stories in general and books in particular, so I was always interested in writing. But the decision to become a writer professionally—and the requisite skills for the job—developed over a few years. 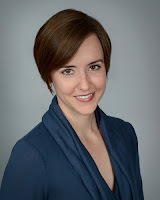 It creates an additional opportunity to connect with readers and other authors, which is great. But it can become a distraction from the writing, so I’ve found that I need to set my expectations when it comes to my own involvement with it. On the fiction side, I’m polishing a few short stories and working on an outline for the third book in the Recoletta series. On the games front, I’m writing for The White March, the expansion to Pillars of Eternity, and I’m especially excited about introducing a new companion: the Devil of Caroc. Keep writing! Find writing partners or a critique group if you can. It’s important to get feedback, and knowing that you have an audience is a huge motivation. Tomorrow we've got something a bit special - Carrie Patel, narrative designer and writer for the Kickstarter hit, Pillars of Eternity, and author of the rather good The Buried Life, is going to do an interview for us to celebrate the release of the next book in her sequence, Cities and Thrones, which we reviewed back in May. It's an interesting work, populated by well realised characters in a unique world, and we're delighted to have Carrie talking to us. 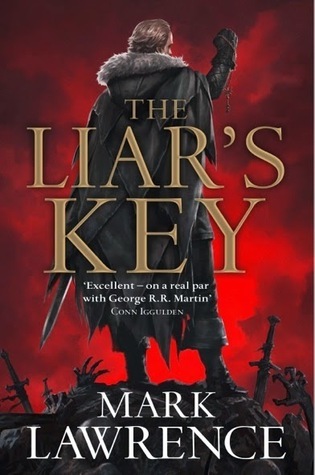 The Liar’s Key is the second in Mark Lawrence’s ‘Red Queen’s War’ trilogy. In summary, it’s a really well done character piece, focused on Jalan – the dissolute, cowardly, crafty and self-serving protagonist that we last saw, at the end of the previous volume in the series, settling down for a long winter, after barely surviving the retrieval of ‘Loki’s key’, an artefact with the potential to open any door. This book kicks off effectively where the last one finished; Jalan and Snorri, the Prince and the Viking, are briefly settled in the town of Trond, recovering from their adventures. As the ice thaws, however, Snorri becomes determined to leave, to take the artefact which the two of them managed to retrieve, and use it to open the door into death, in an effort to rescue his wife and children – but first he needs to find someone who can tell him where the door is. Jalan initially goes along with this, somewhat out of loyalty to Snorri, but also because it fits with his own desire – to get away from the frostbitten north, and back to his southern home – a case where absence has definitely made the heart grow fonder. We get to see a bit more of Lawrence’s Broken Empire setting as the characters journey south. It’s wonderful to see the contrasts here – after the frozen howling of the opening, there’s a sea voyage, leaving our heroes lashed with salt and spray. There’s a tour of dark forests, laced with trolls and dead men. Then there’s the South – a warmer climate, the dangers less obvious, the lines between truth and lies less clear. Jalan drags us from the stark deadliness of the North into the cloying venom of the South, from Great Halls to halls of finance. There’s a sprawling scope to the geography, a feeling of the breadth of the Empire. It makes the world feel larger, and at the same time, more real. Lawrence shows us snow covered icecaps and urban areas, thronging with different cultures – and the feeling of familiarity blended with the unusual is expertly done. The Empire really comes alive on the page. There’s some interesting new locations this time as well – I won’t give any details, for spoilers sake this close to release, but there’s certainly one or two that I wasn’t expecting, where the descriptions absolutely scintillated – Lawrence has always excelled at giving us the mysterious, the wondrous and the terrifying in equal measure, and there’s no change here. From a character point of view, there’s a shift in focus from the first volume, which focused on the relationship between Jalan and Snorri. Now there’s a larger supporting cast of characters, several of whom have key roles to play – though the core relationship remains that of the Viking and the Prince. That said, despite the larger cast, it feels like this narrative is more focused on Jalan than the overall ensemble. The Jalan of the previous volume was a narcissist, a coward, and a pragmatic opportunist. He changed over the course of that book – though perhaps not as much as one might expect – and his transition continues here. It’s worth mentioning that this isn’t a redemptive arc, per se. Jalan’s character shifts, by degrees, but where it will end up - which of the many people he could be that he’ll actually become – remains opaque. Still, it feels like our protagonist is growing up, gradually seizing hold of parts of a world where the consequences of his actions are starting to have a larger impact. We also get to see a swathe of Jalan’s family history, giving us insight into his immediate ancestors – including his deceased mother, and formidable grandparent, the Red Queen, as well as Jalan’s childhood. The latter sections are excellent, giving us another view on Jalan, as a boy with appalling courage, scarred and bent into shape by the events that occur around him. The Jalan of today is likeable, but the boy of yesterday is downright fierce. His history shapes the man we thought we knew from the previous book, and gives us a new perspective on his underlying motivations – and at the same time, the memories of his past soak back into Jalan, and help shape the character of the individual he’s becoming. Quite what the result fo this will be, I’m not sure, but it’s fascinating to watch. Alongside Jalan’s past, we get a look at further back, at the rise of the Red Queen. A remote, stark power in the present, the more intimate view we’re afforded here, of her and her siblings, is both intriguing and horrifying. Unlike Jalan, the Red Queen seems to always know who she is. She has his drive, but focused on other goals than his. There’s some great stuff in here – some wonderful past scenes that hint at the shaping of some of the larger forces in the Broken Empire, and a general likelihood that things are going to get messy, breaking up the character driven tension of Jalan’s journey nicely. I won’t get into the plot, for fear of spoilers, but it’s an excellent adventure. With the focus on Jalan, there’s a lot of opportunity for humour, which wraps around and through the darker themes in his development wonderfully. The journey south is well presented, and there’s an excellent set of obstacles and goals, both internally and externally. Adventure and danger go hand in hand, and Jalan runs away from all of them in a manner that left me rapidly turning pages just to see what happened next – how he was going to get into or out of trouble this time, and who he’d be at the end of each escapade. In summary then, The Liar’s Key is a worthy sequel to the excellent Prince of Fools. We get another fast paced adventure; we get some wonderfully crafted characters, with believable motivations and personal journeys that affect both our perception of them and theirs of themselves – and we get it all in the Broken Empire’s unique setting. Is it worth treading? Absolutely. If you haven’t read Prince of Fools already, do that first; if you have, then you owe it to yourself to pick up this scintillating sequel. Just finished Mark Lawrence's latest, The Liar's Key. It's well written, well paced, and there's a lot to like about it. It's several excellent character studies, with some swords and sorcery thrown in. I need to mull it over, but should have a more detailed review tomorrow. Two of Swords is the new serialised novel by K.J. Parker. The first five parts are available now, and run to about eighty pages each. Further parts will be made available on a monthly basis. I’m going to try and put out a review for one of the currently available parts each week, and then review each new part in the month where it becomes available. 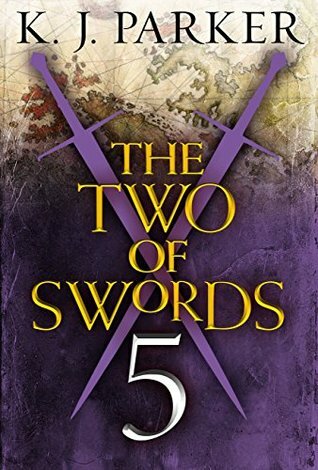 This fifth section of Two of Swords takes the reader somewhere new. We’ve been at the ground level of the ongoing war in the first two parts, introduced to politics in the third, and given a broader perspective in the fourth. Across the whole conflict, however – social, military, political – there has been a sense of balance. East and West, similar enough to tear each other apart over minor differences, each side looking for a way to tip the balance their way. The balance, in this case, being held by the Belot brothers. We’ve heard of them before, in preceding parts of the text – both fearsome generals, able to turn certain defeat into glorious victory, and each fighting for one side because their brother fights for the other. The reader is now taken into the head of one of those Belots, giving us a view of the war which is both highly placed, and highly personal. What we have here is more akin to a solo character study than an ensemble piece. The text examines this Belot’s relationship with his wife, and it manages the trick of making what could have been a remote, chilly character seem endearing. Our protagonist for this piece is marred by his apparent dislike of his brother, a defining factor which appears to have shaped the trajectory of the world around them – though there’s also a well crafted impression that this is now a matter of resigned form, paradoxically existing alongside an older seething and poisoned relationship. But at the same time, ‘our’ Belot is wrapped up in his wife, and this shows through, both externally, in his determination to protect her, and internally, in the way in which he delights in and accepts her presence. It’s a credit to Parker that the reader can feel both sides of Belot’s emotional coin. There’s some other stuff going on here of course. Belot is, after all, a general. Several sections of the text are centred around key battles, or the planning of same. At least one of these is a reaction to the events portrayed in the preceding volume. Both have Parker’s usual complement of unfortunate events, and have an immediacy gained by the viewpoint character which helps make them feel real. As with preceding parts, there are several twists and turns, and this section promises to have a great impact on everything that follows thereafter – it’s raised questions about how the next part will move forward, and where exactly it will be going to when it does so. As an aside, this volume felt particularly short – it’s around 40 pages, to the 60 of the preceding one. It’s a shame, because I would have enjoyed more time in Belot’s head; he has the relentless self-awareness that Parker does very well, and his relationship with his brother, briefly shown as it is, feels like it should be given a book all of it’s own. Is it worth reading? I’d guess it would be less enjoyable as a piece of solo fiction than the preceding parts. It feels as if the volumes that came before are providing a valuable context, which makes each event here have extra layer of meaning. Still, evebn as a standalone, it’s a tight, well done piece of fiction. As part of something larger, and with the promise of more volumes to come, it’s very enjoyable – though the end does come perhaps too soon. Tomorrow will see another in my ongoing series of reviews of K.J. Parker's "Two of Swords", which is being released in installments as a serial novel. Part Five came out last week, and made for an interesting read - it certainly changed the likely direction of the overall narrative, though it felt a bit weaker than previous installments. 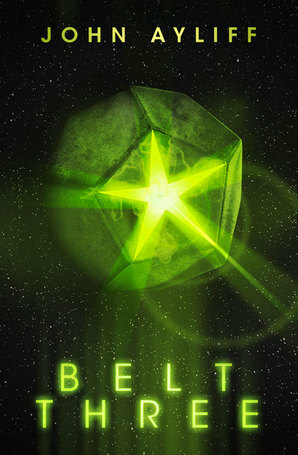 Belt Three is an intriguing and intense sci-fi novel. It picks up some good ideas and runs with them.at core, it has some complex feeling characters, in a well-developed world, though it would have been nice to see more of both. The setting is one of the central pillars of any text – and here, the reader feels that perhaps more than usual. The universe the characters inhabit is one set after the end of the world – literally. Mysterious entities, known as the Worldbreakers, have devastated our solar system, slowly grinding the habitable planets into belts of rock and dust. Centuries after this cataclysm, the Worldbreakers continue to grind down the remnants of human civilisation – and humanity has adapted their society to cope with the ever present possibility of extinction. Some of these adaptations are plausible, interesting, and have a broad impact on the setting. For example, the creation of working cloning technology allows both an explanation of humanity’s survival, and an exploration of discrimination and social issues; the clones are treated appallingly in many cases, issued identifying numbers, and considered less than human. The author gives us an opportunity to see the social pressures that have led to this situation, and provides counter-examples, letting the reader see what other characters do not – that the clones are as human as the few “trueborn” who serve as the aristocracy. The text does also start to address the reasons for the current social configuration – there’s some wonderful dialogue later in the text which explores this. On the other hand, it feels like there’s a lot more room here for further consideration of these issues, and it would have been good to see them examined further. Similarly, the setting includes neural programming – individuals are able to write programs to their own minds, turning, for example, mild-mannered supervisors into deadly combatants. This is associated with the cloning mentioned above – clones can simply be mind-wiped, their personalities erased, left as husks with new skills implanted. The gruesome nature of this procedure, and its ramifications, are examined in the text – but again, it would have been fascinating to look at this in greater depth. At any rate, the setting is full of interesting ideas, ones which it isn’t afraid to use to draw the reader in, and use in the purposes of the narrative. The universe, as a whole, feels like it’s lived in. It also feels remarkably unpleasant, almost hopeless, but that seems to be part of the theme of the text – the characters exist in an ever-tightening gyre, their society constantly inching toward ruin. The reader can see some of that in the characters as well. The central relationship begins as one between a pirate and a hostage. The former, the author portrays as less brutal than callous; she’s more than happy to scrub the minds of a clone crew, but drawn to their new captain – though only as both a potential ransom and potential company. The author manages to portray a cold, driven individual in the narrative present, one determined to fight, both against the horrors of her past, and whose past forces her to keep fighting now, even when those fights seem hopeless. We’re also allowed glimpses into her back-story, via the memories of another individual, which allow us to see how the almost monstrous creature found at the start of the book has been shaped from some very different beginnings – and also what she’s looking for. The literary device used to do this is rather clever, and the arc for the character is both believable and compulsive reading. The other half of this duo is her captive, who is something quite different. Initially both arrogant and terrified. Determined to preserve himself, and to escape. A man with none of the drive to fight that we see in his captor – but with a great talent for manipulation. A kind of wry cleverness which helps drive the story forward. He’s also struggling against his own secrets and inner demons, which are eked out more linearly across the text. Still, they do make for absorbing reading. Both characters are given room to grow and develop organically through the actions of the narrative, and are thoroughly enjoyable to read. That said, it would have been great to have seen more of them, been given just a little more insight into their inner workings, been given a slightly broader perspective on their journey outside the text. Still, the relationship between them is wonderfully done – the air fairly crackles around each line of dialogue. The plot isn’t exactly straightforward, but it feels pared back to basic elements, means of pushing forward the characters who are the real focus of the text. I won’t spoil it here, but I will say that the central thrust is the determination of both characters to change their universe – though in quite different ways. Really, it would have been great to have seen this in more depth – it felt like the book was over too quickly, which was a shame – it left me hungry for more. Is it worth reading? If you’re looking for a post-apocalyptic science fiction universe, with some great character relationships, and some interesting musings on what makes us human, and how far we’re willing to go, both for ourselves and for others. Working on an interesting sci-fi novel by Jon Ayliff; "Belt Three" appears to take place some time after the arrival of several giant entities, which have slowly devoured the inner solar system. People have managed to survive this, and are now dealing with the consequences. There's some other interesting ideas here, around cloning, class, and identity, and it's been a fun read thus far. Will have a review after the weekend. 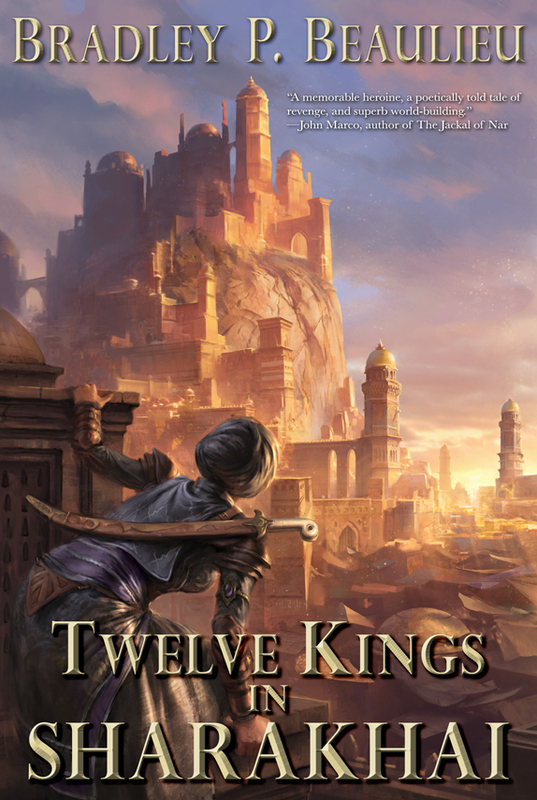 Twelve Kings in Sharakhai is the first novel in a new sequence from Bradley P. Beaulieu. It’s set, unsurprisingly, in the city of Sharakhai, a thriving metropolis, ruled by twelve sorcerer kings, surrounded on all sides by shifting desert sands – and by enemies. The reader follows Çeda, who begins the novel as a gladiator in the fighting pits of Sharakhai, as she explores her future, redefines her past, and sets out to kill the Kings of Sharakhai. The setting is one of the absolute stars of this text. The city of Sharakhai feels like a living organism in itself. As we follow Çeda and some of the supporting cast around the city, their eyes show us the edifice that surrounds them. It’s dusty, sprawling and bloody; an urban junkyard dog. There are the pit fighters that the protagonist is part of, and their scrapping, often deadly combats. There’s the cloaked menace of the Maidens, the elite bodyguards of the Kings, stalking through the city, using their loyalty and capacity for lethality like a shield. It’s not just that though. There’s the broader conflicts, between the city Kings and the tribes of the desert, a guerrilla campaign, mercilessly waged by two sides that seem to be murdering by reflex. Each drop of blood, each grudge, each crossed sword and crossed word is part of a larger whole, a skein of conflicted loyalties and plots of revenge, wrapped around the entire city like an invisible web. The reader doesn’t see much of most of these, but each character feels like they have a story, even if there isn’t time for it to be told here; the background characters in the setting still feel like people, rather than parts of the scenery. At the same time as all of the blood, conspiracy and vengeance, there are other stories – stories of compassion, of love, of understanding between parties. And there are mysteries, multi-layered in complexity that are both baffling and enticing. The above may show off some of the complexity of the setting, but it doesn’t truly describe the wonderful and pervasive aesthetic that runs through the narrative. The inevitable comparison is to the Thousand and One Nights – and the mixture of pride and passion, cruelty and faith, mean it isn’t an entirely invalid one. What Beaulieu has done though, is create a setting with the feel of a fable, rather than a fairy tale, a story told over a campfire in shifting sands on a dark night, a place where the fantastical abuts with the normal, where monsters walk the streets with spice peddlers and swordsmen, and blended it all together. It evokes visuals of rooftop chases, swordfights in moonlight, and the romance of the street rat and the princess – and then enfolds them in a universe with consequences, where swords cut, and where the street rat is more likely to rob the princess than romance her. The text skilfully evokes a sense that all things are possible, and draws the reader into the world that embodies that sense. Of course, a world isn’t much without the characters to inhabit it. Even if your background characters don’t feel like scenery, you need someone front and centre, to take the reader along with them. In this case, that someone is Çeda. She begins the novel as an angry, tormented young woman, fighting in the pits of Sharakhai for money , fame, and the chance to test her skill – and running potentially illegal packages for her patron as a side-occupation. Beaulieu gives us a highly competent protagonist, who quickly demonstrates a talent for duplicity as well as for swordplay; but he also manages to make her emotions real. The long-simmering rage she feels over the death of her mother, the quiet, complex affection for Emre, her old friend – both leap off the page, the raw humanity of the feelings presented washing over the reader. The same is true of the supporting cast – Emre, for example, gets the occasional chapter of his own, and the narrative voice feels different, but equally genuine. Some of the antagonists are a bit more awkward, feel a little less human, but that may actually be by design. Beaulieu also plays with reader expectations of characters, switching between the present moment, and chapters set at different stages in the past; the reader is shown friends become something less, and something more, over time, shown the impact of past decisions, often chapters before actually showing the reasons for those decisions to the reader. At the same time, the present strand of narrative continually realigns characters views, as they discover that the reasons for events in the past are perhaps not what they remembered. It’s a nice technique, and it means that as the reader is exposed to the characters, the characters are also in flux, being exposed to themselves. It’s also nice to see a set of characters that blend well together in a uniquely human way; all the relationships between characters feel well realised, with emotional and intelligence behind them; they also feel messy. What in other books might be a hero works with what in other books might be a villain, tied together by family connections and a desire for revenge. There’s Çeda, who is the reverse of a damsel in distress, and the way her relationship with Emre, built on trust and shared pain, stretches, even tears in some places, and builds in others, as truths and actions pour out of the plot. The characters feel like people, and the relationships that they tie between themselves also feel like the ones that people have, rather than being what the narrative requires. Speaking of the narrative, there’s some good stuff here. It has a tendency to get a bit complicated, to spin off into interesting tangents, to show the complexity of the system, the way which everything ties together. But running through that plot, like a core of molten steel, is Çeda’s quest for vengeance for the death of her mother. It keeps the sprawling story on course, and as focused as Çeda herself. It can be a bit of a slow burner, as the reader is inducted into the world of Sharakhai, but over time, layers upon layers of complexity are added, and these make the emotional payoffs all the more satisfying. I won’t spoil the details of the story, but there’s the occasional bit of explosive magic and the odd spectacular swordfight, too. In summary, this is the start of a grand fantasy epic; it’s also the start of a personal story, one lined with great characters, in a fully realised, fantastic world. The text seizes both of these things, blends them, and makes something great – give it a whirl. Bradley P. Beaulieu has created something a bit special with Twelve Kings in Sharakhai - a unique world, with flavours of the Arabian Nights, and a layer of grit, grime and moral complexity that makes for an intriguing and compelling narrative. Really enjoying it - more tomorrow! Red Rising is, starting simply, a very good read. It's smart, doesn't pull any punches, and grips the attention effectively. It turned out to be very hard to put down. The text follows a young man called Darrow, who works beneath the surface of Mars as a `Helldiver', digging into the crust of the planet to get at the valuable materials needed within, as part of a centuries-long terraforming effort. Life is harsh and brutal, but in the service of a greater goal. But over the course of the first part of the novel, all of Darrow's preconceptions about his society, its structure and purpose, are abruptly challenged. There are two real stars in this text. The first is Darrow, of whom more in a moment. The other is this society of future-Mars. It's incredibly well drawn and believable. Possibly not very likable, but believable. Appropriately, there seems to be a strong classical theme running through the text; the Martian elite, in particular, strongly evoke the Roman senatorial class. Each section of the society is, at least briefly, shown, and (particularly for the lower and higher ends of the spectrum) their customs and social mores explored in some depth. The author seems to have set out to build a fully functional society (if a rather brutal one), and has succeeded. As a world, it draws the reader in, and then doesn't let go. The other star of the text is Darrow, the protagonist - a teenager brought up in the harsh lower levels of Mars; strong, clever, and willing to take risks, a boy with a wild temper, but also shown to have a great affection for those closes to him. It's the flaws in Darrow's character that make him stand out from other protagonists in the same vein (Katniss et al. ); his confusion, sudden rages, and impulses of affection ring very true. Over the course of the text, though, the reader sees him change, and grow as he fits (and is flung) into various situations - some of this growth is for the better, some of it...not so much. But at all turns, as a protagonist, Darrow is consistent within himself, but also changes as situations make their mark - much like a real person. The supporting characters aren't as well drawn as Darrow, but as the text is written in the first person, that may be intentional - the reader, as Darrow, doesn't have access to the thoughts and feelings of those around them. However, where given the opportunity, these other characters do shine - they aren't simple caricatures - but it would have been nicer to have been given a view on some of the depths of character hinted at through the text. Overall, this is a great book, and a pleasure to read. It's often violent, but never compromises on the consequences. The characters are often unpleasant, but they grow and change over the text - and they, too, live with consequences. The comparisons to The Hunger Games are perhaps inevitable, but I think a more apt comparison might be Ender's Game - in spirit, if not in setting. At any rate this is a book which is both a page turning, thrill a minute reed, and a rather more reflective piece on society and our roles within it. Absolutely worth reading. 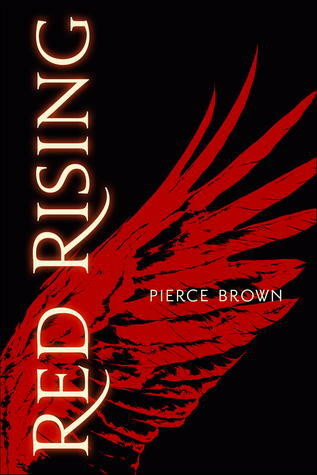 Tomorrow I'm finally going to get around to posting a review of Pierce Brown's brutal and fascinating Red Rising - a sci-fi story with underpinnings of Roman history, wrapped in a gritty layer of revenge. It's really good, and I'm hoping to put up a review of the sequel soon as well. Later in the week we also ought to have something for Bradley Beaulieu's new book, Twelve Kings in Sharakhai. This one has a wonderful aesthetic, an endless desert, dark sorcery, intriguing mysteries. The obvious comparison is to the Arabian Nights tales, with a lot of grime and blood over the top, but it feels like a more complicated narrative than that so far. Anyway, more later in the week! Ready Player One is a paean, a hymn, a loving ballad to the eighties, to geek culture, and to geeks everywhere. It's also a pretty good read. It's set in a fairly near, semi-dystopian future, where increasing numbers of people have withdrawn from `reality' in order to spend their time in a complex virtual world simulation known as `OASIS'. When one of the creators of OASIS dies, he leaves his entire fortune, and control of OASIS, to whoever manages to interpret a series of cryptic clues based around his obsessions (the eighties, and `geek' culture), and recover an `easter egg'. One of the people looking for this `egg' is teenager Wade, whose first person perspective is the basis for the novel. Wade comes from a fairly underprivileged background in this semi-dystopian society, and finds his only escape in OASIS, hunting the `egg'. Wade is a likable narrator, for the most part, and his wry-yet-earnest voice is consistent, and probably resonates with readers looking back on, or participating in, their teenage years. His quest for the `egg' is the underlying narrative of the novel, and it has echoes of The DaVinci Code, with cryptic riddles that both narrator and reader will struggle to find solutions to - and with solutions that, when explained, are wonderfully clear. There are some nice underlying themes in the text as well - the idea that part of the reason society has collapsed was the creation of a better society, for one, and how far we allow our interactions in a virtual world to filter our perceptions of the `real' for another. Beside this, and the adventure-quest strand, there's also the gradual growth of Wade as a character, both inside and outside of the OASIS simulation - a classic coming of age tale, pleasantly modernised. Perhaps the greatest strength of the text is massive homage to geek culture - from Atari to Dungeons and Dragons, 80's cartoons to Star Trek - everything is here, and wonderfully used to weave the tapestry of the narrative. If you grew up in the eighties and nineties, and were a geek then (or now), many references will come across as old friends, cloaked in comforting nostalgia. Unfortunately, this strength is also a weakness; the text depends on these references, at least somewhat, and whilst an effort is made to explain the key ones through exposition when relevant, someone coming in `cold', without knowledge of the genre, may find it something of a struggle. Similarly, the `real' world has intriguing promise as a setting, and is almost criminally underused - I'd love to see more in the same setting, but wish it had been fleshed out further to begin with. The characters outside of our narrator are also a little light, but this may come as a side-effect of the first- person narrative. This is Wade's story, but it would have been nice to see a little more personal growth from the supporting cast. That said, the whole thing is a fast-paced quest novel. The pace is there, the action, when it occurs, is memorable and snappy. The dialogue is laced with witty references, and the quest-narrative is compulsive reading. Overall, this is a great book for the audience it seems to have been pitched at - 80's, 90's, and today's geeks will have no trouble losing themselves in the text. It may be harder to come to if you lack those sub-cultural reference points; however, given this flaw, it remains an entertaining, rip-roaring adventure and mystery story, well worth the read. 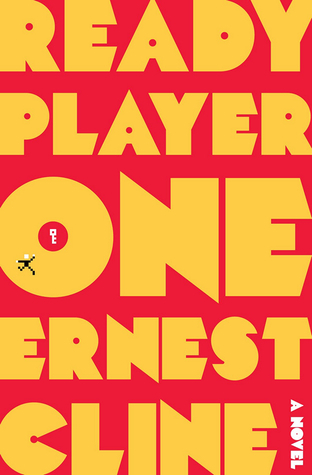 Since I've just done a review of Armada , this seemed like a good time to look back at Ernest Cline's debut, the thoroughly enjoyable Ready Player One - so there'll be a review of that up tomorrow. 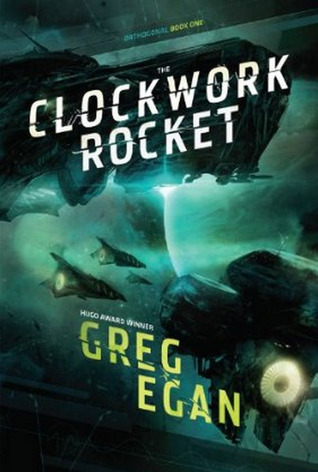 Greg Egan’s The Clockwork Rocket is an incredibly imaginative read. It posits a universe with physics different from our own, and then explores the consequences of those differences, across biology, sociology, mathematics, astronomy and, yes, physics. It’s a revelatory piece of fiction, and an exceptional work of imagination. On the other hand, parts of it feel more like the reader is in a classroom than a novel. The narrative centres around Yalda; it follows her life from childhood, as one of several daughters in a farm, through her life as an academic, and beyond. But Yalda lives in an environment very different from our own. The most obvious differences are the physical – Yalda’s species are shape shifters, able to generate limbs within themselves, to move their body mass around to perform tasks. Egan manages to make this seem commonplace within the narrative – causing the extraordinary to seem ordinary. By the close of the text, the reader is likely accustomed to addition and subtraction of limbs. But there’s a biological and social exploration here as well – the species reproduces by fission, and as such, each daughter is eliminated in her own act of procreation. Egan uses this as a rather novel way to talk about gender roles in society. Yalda is almost an archetypal strong female protagonist – if not revolutionary, she’s certainly determined, and unlikely to bend under social pressures. There’s some wonderful discussions around contraception and childcare in a universe where every family is a single parent – and layers of subtext around Yalda and her circle, as the women of the species begin to take up roles in society that demand longevity. So there’s an interesting universe here. My only issue is that the fundamental physics change that the author has made is what underlies that entire universe. Which is excellent – but the infodumps required to bring the reader up to speed are rather intensive. They’re masked in the narrative as part of the process of scientific discovery for the characters – and are, in that sense, entirely narratively appropriate. However, there are quite a lot of diagrams in the text, and many of them have some degree of geometry or velocity calculations in them. What they have to say is legitimately interesting, it’s just a shame that it wasn’t possible to make them a little more digestible, from the point of view of the reader. The characters are, largely, backgrops against which our protagonist operates. There’s a couple of antagonists, though their threats never feel entirely serious. And there are a great deal more friends and acquaintances of the protagonist, who feel a tad more real; it’s a shame we don’t get to spend more time with them. Yalda, on the other hand, is a well realised character – with her own thoughts, feelings and goals. Some of these goals may feel a bit alien, but most are recognisable enough to inspire empathy in the reader. At any rate, the protagonist feels like a person. A slightly odd person, operating in a world entirely different from our own, but still a character that the reader can make themselves at home with. From a plot point of view, we’re left following Yalda as she investigates the ‘Hurtlers’, a possibly cataclysmic series of falling stars in her universe. At the same time we follow Yalda’s evolution as an individual, and the shifting social structure in which she is to be found. There’s a lot going on here. Much of it, especially the social aspect and the struggle with the Hurtlers, is quite compelling – aand I found myself quite keen to find out what happened next. Really, it’s all very clever stuff, and I’m interested to see where Egan takes the next book in the series. It’s a shame that a lot of it is wrapped in some rather esoteric scientific dialogue, but I’m genuinely impressed by the depth and breadth of imagination on display, as well. Is it worth reading? If you have a reasonable tolerance for theoretical or imaginary physics, absolutely. If you want to approach a genuinely different universe, expertly portrayed, then yes. It’s a decent read, either way – just be aware what you’re getting into. Just finishing up Greg Egan's "The Clockwork Rocket"; it's absolutely full of ideas, including an entirely different take on..er..physics. This leads to some interesting and highly imaginative scenarios, though it can be a bit difficult to totally understand at times. 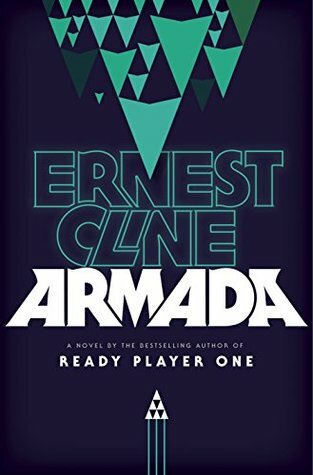 Armada is Ernest Cline’s second novel; after the runaway success of the first, Read Player One, it has rather a lot to live up to. Does it succeed? Taken on its own terms, I think that it does. At heart, Armada is a science fiction adventure blended with a family drama. Our protagonist is a damaged teenager – a product of a single parent family without a father, a smart young everyman with a few self-control issues. He’s the bridge between the two strands of the story; one strand about the movement from teenager to adulthood, about dealing with loss, and the importance of friendship, and the other…well, the other is about Starfighters, alien species, mysterious government agencies, and a great many explosions. It’s to Cline’s credit that he largely manages to balance these competing narratives, and actually merge them into a cohesive whole. From a character point of view, the focus is very much on our protagonist, the somewhat improbably named Zack Lightman. At the start of the story, he spends a great deal of time at school, where he’s apparently viewed somewhat askance due to an alluded to “Incident” in his past, but seems reasonably well adjusted .When not at school, he’s either working as a clerk at the local video-game emporium, or at home, attempting to avoid his mother, as well as questions about what he’s going to do after finishing high school. If he doesn’t stand in for the reader, he’s certainly the sort of everyday wholesome teen hero that populated family films of the eighties, and it feels like this has been done deliberately. Zack is also apparently one of the top ten players in the world of a particular online game, flying Starfighters against a malevolent alien race with his friends. Speaking of friends, there’s a supporting cast here as well; Zack’s two best friends, with whom he plays constant rounds of the aforesaid game; Zack’s long suffering, quietly competent, and, perhaps, lonely mother; his high school bully nemesis; the cheerfully obnoxious mentor who serves as his boss. A little way into the narrative, he even picks up a love interest. That said, in some ways they feel a bit thin, increasingly so as they’re joined by other individuals as the plot progresses. They make perfectly good foils for Zack’s own internal journey, and each individual does seem to have a distinct voice, but it would have been nice to see them get more time on the page, to be something more than a collection of traits. Zack’s love interest does manage this to some degree, but even here, the character doesn’t feel like they get enough room to manoeuvre. The largest relationship hovering over the page is one defined by absence – Zack feels linked to his father, and seems defined by his desire to understand and emulate a man who died when he was an infant. There’s a sense of loss, a sense of pain and a feeling of movement toward closure, which gives Zack a depth that he sorely needs; it also provides the stimulus for some of the most wonderfully fraught emotional moments in the text. To Cline’s credit, he always manages to wrap his characters in emotional envelopes which feel real, feel human. There’s some wonderful moments when Zack and his ensemble crew face off against threats – existential and physical – and the roar of camaraderie off the page is impossible to drown out. And there are quieter, harder moments as well, which may well wring a tear from even the cynical amongst us. It’s that optimism which makes Cline’s story so compelling, that and a sharp eye for humanity at its best, and what makes people the way that they are. There’s a lot of great stuff here - the action plot rattles along nicely, and there’s enough robotic gunfights to satiate even the greatest scrap metal enthusiast. But the core of the tale is the relationship that Zack has with those around him, and if Cline struggles to make the supporting cast feel deep, he does succeed in making them feel human in their interactions with Zack. At the end of the day, Armada is a love letter to the eighties; it has a self-awareness that makes this pleasant, rather than awkward, accepting its debt to The Last Starfighter and Flight of the Navigator in good humour. There’s gunfights, space battles, giant robots trampling everything underfoot – and quiet human moments that make it all hang together, with an emotional sincerity shot through the narrative that gives it real character. If that sounds like your sort of thing, then Armada is definitely worth your time. Still working my way through Armada. Has some really well done emotional moments wrapped up in layers of 80's pop culture and exploding aliens. Working my way through Ernest Cline's latest, Armada, now, and hoping to have a review up after the weekend. Currently it feels like a love letter to eighties adventure movies, with a bit of a gaming layer thrown over the top - The Last Starfighter in novel form. It's also been quite a compulsive, easy read! 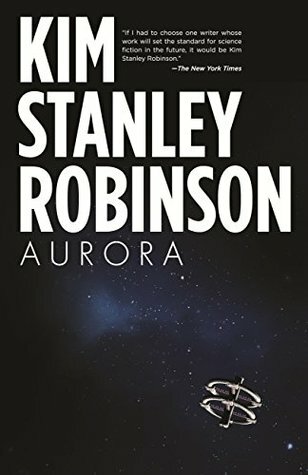 Aurora is big science fiction. It has a vast scope, and attempts to both ask and answer big questions about humanity, and our place in the universe. But it isn’t just that. It’s also a surprisingly intimate piece, the narrative deliberately pared down to human moments within a broader canvas. Most of the time, this narrative is interesting and revelatory – but there are moments when it peaks, and the reader is wrapped in the prose, and drawn toward the sublime. The central strand of the text concerns the journey of several thousand humans in a “Generation Ship” to Tau Ceti, the nearest star with planets assessed as being capable of supporting humans. In a genre which often seems focused technological advance, with hyperdrives and lightspeed, the use of a ship which takes multiple human generations to reach its destination is a pleasant novelty. It also allows for examination of broader questions. The ship of the text is now an old one, theinitial focus of the narrative the last few years before it finally reaches its destination. The reader is drawn into the life of “Ship”, as it is called; and that life is not just humanity. The reader is shown the way in which the entirety of the ship is a closed ecosystem, each ecological niche for colonisation supported by a separate biome. How people are fitted into this system, a self-contained island in the sky. Robinson is known for writing about these sorts of enclosed, elaborate systems, and the detail here is both comprehensive and believable. Whilst the characters are interesting enough, the portrayal of the ship-as-organism, the focus on the whole rather than the sum, may be the most intriguing part of the text. This interest in systems, and in the role that humans play as actors in those systems, is spun out further, as Robinson explores humanity’s colonisation effort, and the aftermath. In some ways, the text can often feel dry – there are spikes of dramatic tension, moments where pressures simply become too great, and the system spins toward entropy – and these are shown with a certain detachment; at the same time, this clinical approach to human disaster can have a high emotional impact – the separation of the viewer from catastrophe, Robinson’s meticulous, beautiful prose using that separation, paradoxically, to invest the reader in the consequences. With the larger focus on systems, it’s worth noting that there is a place for people in this story. Perhaps appropriately, we’re largely tied to one narrative focus, who begins as a young child on the ship, and gradually grows toward adulthood and prominence over the course of the text. At the same time, the narrator of the text gives us a view of other characters, the supporting cast around our protagonist. In all cases, it would have been nice to see more of these characters. Their roles are most often seen in dialogue, between them and the protagonist, or their actions reported as part of the wider context of a problem. The environment these characters inhabit feels alive; the way that they speak feels like there are deeper personalities behind them – we just don’t get the time to look at them in detail. On the other hand, what is shown is enough to move the story along, and whilst the supporting cast often feel a little underdeveloped, they’re interesting enough foils to the protagonist, whose own evolution, wrapped in the tale of the ship, and of Aurora, is extremely compelling. The plot…well, it’s much like the systems portrayed in the text. It begins gradually, easing the reader into this foreign, claustrophobic environment, then gathers momentum toward a crescendo, before slowing to gather pace again. It’s plot in a series of waves, from one crisis to the next – not always the known and the expected either, but always something interesting. I won’t get into it here for fear of spoilers, but will say that I kept on turning pages, hoping to see what happened next . And that’s perhaps the highlight of the book, in a way – it makes a genuine attempt, on a wide scale, to show the reader not just how the human narrative works, but how everything in a system works, and, when a journey comes to a close, what may happen next. Currently hoping, if I read quickly, to get a review of Kim Stanley Robinson's new work on generation ships, Aurora, out tomorrow. It's been pretty great so far. Bit dry sometimes, but compelling. 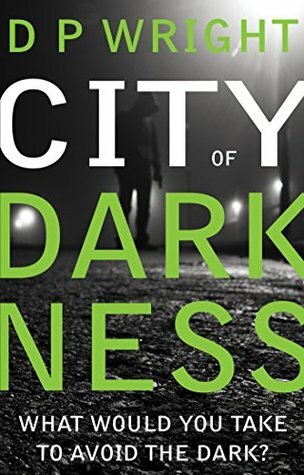 City of Darkness is an investigative noir thriller, set within an urban dystopia. Actually, to call it a dystopia is putting it mildly. The author has created a tiered society, both socially and geographically. The sole city seems to resemble a tower, one of dizzying heights and depths. The upper reaches appear to lead a tolerable existence, fed by their dependence on shadowy and seemingly all-powerful corporations. The lower reaches seem to range from moderately unpleasant to downright hostile. Wright does an excellent job of immersing the reader into this setting. Much like the semi-poisonous air of the lower reaches, his city reaches out to the reader, enfolds them within it, and starts to feel alive. Grotesque, yes. Frightening, absolutely. But very much an entity, packed with its own feel, and with lives being lived within it. Admittedly, those lives are, to steal an aphorism, nasty, brutish and short – but still lives. The setting feels lived in, but at the same time it feels dreadful. The author’s done a good job here, not just in the patina of grime and hustle and bustle that defines a city, but in overlaying that with a gestalt mood of misery. Of course, though the setting is typically unpleasant, it’s only part of the story. Another is the characters. Here things are a bit more of a mixed bag. The story centres around a private detective. A living embodiment of the noir tropes of the forties and fifties, with some modern adjustments. Our protagonist (hero seems somehow incorrect) is a hard drinking misanthrope, working for the money, using whatever’s left over after cheap booze to score rounds of recreational drugs. There’s the implication that his life was at one stage something more – possibly even something better – but this is only hinted at, and not explored within the text. Instead the reader spends their time in the moment, in the head of a man who is, if not actively unpleasant, at least slowly disintegrating; in this, he’s a mirror of the society around him. Still, this central role demands a forceful personality, and we do get that. Some of the character building is typical of the genre; the vices noted above are practically de rigeur for noir detectives, even if they have been given a few rougher edges. That said, there’s a few nice sparks of originality here – mostly in the protagonists reactions to other characters, and in the way he recognises and mirrors their own humanity back to them. This supporting cast is rather diverse, ranging from the ingénue client, who begins the novel seeking justice for a murder and gradually shifts toward wanting revenge, through a rotating cast of antagonists, ranging from mildly malevolent to downright diabolical, and back to old friends of the protagonist, dragged back into this darker life under protest. It’s in these relationships that the characters find their feet. Whilst their building blocks are common enough, and identifiable, the relationships crafted between them feel unique. There’s a few moments where it feels like they’re acting as the plot demands, rather than as personality might require, but these are relatively few, and the interactions between these awkward moments do help make the characters into, well, people; there’s a particularly good relationship between the protagonist and one of his old associates, a Doctor – just the right mix of thawing dislike, camaraderie, and shared experience, which made for a thoroughly enjoyable read. One of the issues, though, is in the antagonists. Though the greater adversaries aren’t made clear at the start, both they and the lower tier of enemy are typified by their unrelenting malice. This is a book which demands shades of grey in the friendlier of its inhabitants – those in conflict with them are downright vile – and may suffer as a result, from feeling less complex than they might deserve. The plot begins as the standard noir potboiler – it rattles along quite nicely until the final third, when the text changes gears a bit, ramping into a pace more reminiscent of a chase movie. There’s some interesting stuff here – the author explores the relevance and place of religion and spirituality in a secular society dominated by the immediate and the material. It feels a little heavy handed, but it was nice to see this approached and engaged with; I’m still pondering whether some parts of the plot and setting are flat out religious allegory, but they still made for a compelling read. Overall then, the author has given us an excellent setting. Within that setting are characters that act within their standard roles, with occasional sparkles of humanity – it would be nice to see the relationships between them explored in more depth, to see more of that spark. The plot is interesting enough, and rattled along sufficiently to keep me interested and entertained in equal measure, and to keep me turning pages. If you’re in the mood for a neo-noir dystopia, this is a solid effort. Should have a review of D.P. Wright's 'City of Darkness' up tomorrow. It's a dystopian-noir style narrative, with some interesting thematic elements.